Adapted from Sunset Magazine, 2008. Preheat oven to 350. Position rack in the middle of the oven. In a bowl of a standing mixer on medium speed, cream butter and sugars until smooth and light. Add the peanut butter and mix until well combined. Add the eggs and vanilla and mix until combined. In another bowl, whisk together the flour, baking soda and oatmeal. Add to the butter mixture, and mix on low until combined. Stir in the chocolate chips. Drop dough by rounded tablespoons onto un-greased baking sheet. Bake 10 -12 minutes or until lightly browned but still soft in the center. Do not over-bake. Remove from oven. 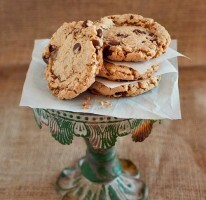 Using the bottom of a flat cup lightly dusted with flour, flatten each cookie slightly. Store your oatmeal peanut butter cookies in an air-tight container.